Absorbs immediately. No strong, overpowering smell. It is the best hand cream I have ever used. This hand cream has a nice consistency, it is not greasy or too heavy. It has a lovely fresh fragrance and hydrates well. The hand cream does well although it is not especially long lasting. The fragrance is pleasant but not overwhelming. Love this cream at bedtime, rejuvenates all night and my hands are so soft in the morning! As with all Dr. Hauschka products, the scent is divine! This is a fast-absorbing product and not waxy or slimy like petroleum products. Bought this for my fiance and I. We both love it. Very hydrating and keeps our hands soft. Planning to buy a couple extra. I have very dry skin. I hoped the hand cream would have the same wonderful moisturizing components of their facial products - but I feel they have missed the mark with this product. It doesn’t leave your hand greasy or oily. It has a very strong fragrance that lingers too. Unfortunately this product doesn’t work for me - but I dearly love every facial product I have tried! Very effective hydrating cream that is not greasy. I love how it leaves my hands moisturized without sticky residue. I put it on and resume my activities right away! I mostly apply this hand cream to my hands just before going to bed. My hands are very soft when I wake up in the morning and stay that way for most of the day. Minnesota winters leaves hand dry and chapped. Hydrating hand cream softens, not greasy and renews the wrinkled look in dry weather. 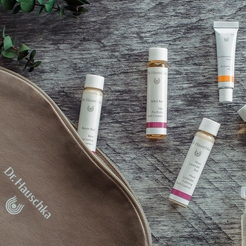 I have been using dr. hauschka products for over 25yrs. Love them especially facial products. Using together with my husband, perfect for man who don’t like any creams because of the greasy feeling after applying. This one is very soft, taking care of resurrected hands, hydrating. Very pleased with this hand cream. I have a tendency with painful skin splits around fingernails from work I do and they have healed up nicely with this cream. I will continue to use this cream and yes at this time would recommend it to anyone else. I love this hand cream. It smells great and absorbs quickly. You will notice a difference from other creams. It is very very good. I've tried lots of hand creams but never had one that worked as well as this one. It isn't greasy. Has a wonderful smell. Hydrates my hands leaving them very soft despite the cold and drying winters here in VT.
Works to hydrate my hands after doing the dishes or laundry. The sample size is lasting me a long time. Not sure if I will buy the full size - I don't love the smell. You can put this hand cream on and continue to do what ever you want to as it is light and not the least bit greasy. I'm amazed at how soft and youthful it makes my skin feel and look. I'm disappointed with this hand cream based on lack of hydration for hands. My hands are very dry. The cream does absorb quickly but the moisture just isn't there. Also, this is a very small size for the price. I wouldn't mind paying the price if it was gold standard in hand cream. Very disappointed in this product. Will not repurchase. In fact, if I could return for free, I would. Sorry to hear you are not 100% satisfied with your purchase. If you would like further assistance please give us a call at 800-247-9907 9am-noon and 1pm-4:30pm Eastern Standard Time, Monday through Friday. I have used this product for years. It's consistent and lovely. It's not greasy like most hand creams, and I feel comfortable applying it right before leaving home. Great hydrating hand cream, leaves the hands moist and smooth. Tried this for the first time recently. I love the smell and the comfort it gives my winter cracked hands. I have tried forever to find a cream that won't smudge the paperwork at my desk and finally got it! I live in New England and it's rough on skin. With the freezing weather and dry air. This was the best my winter ever for my hands and they never looked so good. You won't regret this purchase. I love this hand cream, bar none my favorite I have ever tried. It’s deeply nourishing and long lasting, soaks in and doesn’t feel waxy or oily or leave residue. I use it all the time in the dry weather months and have given it to my sisters for gifts, they loved it too. I keep one on my nightstand and one in my bag. It absorbs quickly and doesn't leave any residue on my hands. The hand skin looks tight and moisturized after using it. I love this hand cream. It has a wonderful, light smell that is not overpowering. It dries quickly so you don't feel greasy. Works great! This hand cream is very nice. It absorbs into the skin quickly and doesn't leave you hands feeling oily. The fresh scent is nice but can be a touch strong for me at times. Overall though I recommend the product. Love it so much I bought 5! I have painful dry hands all winter long. This cream saves them like nothing I’ve ever used. It smells gorgeous, but that’s just an extra bonus. It’s light and never greasy, yet it really works on my otherwise cracked, sensitive hands. I love it and highly recommend it to anyone who struggles with painful hands in the winter. This dry winter I had big problem with my skin of hands. Only Dr. Hauschka brand helped me. Thank you so much! And so highly recommended. The best hand cream i've ever used! It really heals dry skin and smells divine. Perfect cure for winter dryness. I have used many hand products over years and this is the best. My hands are soft and moisturized and the smell is divine. This hand cream is perfect for overworked hands like mine. I love the texture and the scent. I have two tubes - one at work and one at home. It works well with a pleasant smell. Lovely hand cream that absorbs quickly and keeps my hands hydrated. I feel it has been my savior during cold and flu season and having to wash my hands all the time. Usually they are cracked and dry. Not this season. Will use this year round for smooth, pretty hands. This hand cream is wonderful. Absorbs quickly and really hydrates. A necessity in winter. Each year I give this hand cream as a holiday gift to clients, friends, and relatives. Everyone is very happy to receive it! It is also my favorite hand cream for my sensitive skin. What a lovely hand cream. It makes my hands feel so good. I bought this hand cream as stocking stuffers for my daughters and I. They were excited to receive such a high quality hand cream and they have enjoyed using it. It smells gentle and lovely, absorbs quickly, and is non-greasy, but it isn't quite hydrating/protecting enough to get rid of the chapped skin I get around my pointer finger knuckles especially in winter. I put it on after I shower usually. May be it will help if I give it longer. I do a lot of cooking, dishes, cleaning, drawing, gardening, and painting. In other words, I am constantly using my hands, getting them dirty, needing to get them clean. Some hand creams feel nice going on but seem to disappear within minutes. This one feel more durable, creating a nice barrier between my skin and all the work I require of it. I always look for a rich, non-greasy hand lotion that can stand up against the cold temperatures of winter. We spent the holidays in there desert and this cream saved my hands. It absorbs nicely and smells so clean and good. Don't know why it took me so long to try this product it I'm hooked now. It continues to be the best cream I have ever used for my hands in the winter. It makes a wonderful gift with it's subtle rose scent and silky creaminess. It's one of the best hand creams I ever used. Not greasy, light, and super soothing. It's like a band-aid for dry chopped hands. Nice herby scent. Apply regularly to soothe, moisturize and protect dry, overworked hands. Massage into rough skin, including elbows, to soften and refine. Water (Aqua), Alcohol, Glycerin, Althaea Officinalis Root Extract, Anthyllis Vulneraria Extract, Prunus Amygdalus Dulcis (Sweet Almond) Oil, Cetearyl Alcohol, Beeswax (Cera Alba), Prunus Spinosa Flower Extract, Arachis Hypogaea (Peanut) Oil, Simmondsia Chinensis (Jojoba) Seed Oil, Triticum Vulgare (Wheat) Germ Oil, Bentonite, Kalanchoe Daigremontiana Leaf Extract, Daucus Carota Sativa (Carrot) Root Extract, Fragrance (Parfum), Limonene*, Linalool*, Citronellol*, Geraniol*, Citral*, Farnesol*, Benzyl Benzoate*, Eugenol*, Benzyl Salicylate*, Lactose, Lysolecithin, Xanthan Gum.